47 Church Street, Barnsley, South Yorkshire S70 2AS. 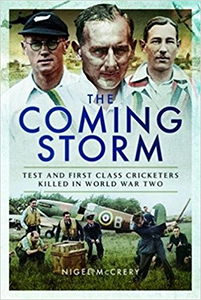 I am not aware of many, if any, books on cricketers who lost their lives in World War Two so Nigel McCrery's The Coming Storm, following on from his book, Final Wicket, on cricketers who died during World War One, is most welcome. Pen & Sword have put together a most beautifully bound and impressive book to complement Nigel's research. Each person's biography includes rank, date of death, teams represented, cricket style and with whom the cricketer served during the war. In most cases, the biography is thorough and a lot will be learnt about these people whose lives were so sadly ended prematurely. Whether the cricketer played Test cricket or just the occasional First-class match, the biography is still given in much detail with an accompanying photograph, where available. In this way, much is learnt about cricketers who might otherwise have been anonymous. It is a fitting tribute to those who lost their lives at an early age. It is understandable that, due to space restraints, not more could be written about Hedley Verity, possible the most well-known cricketer of the one hundred and fifty two mentioned in the book, who fell. The Contents pages and indices at the back of the book also add further to the book. The only shame is some apparent discrepancies with ages against dates of births or deaths on two or three occasions but, this aside, The Coming Storm is a very worthy and invaluable book.